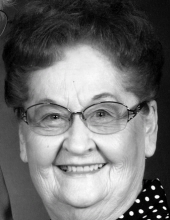 Katherine June Campbell Pfaff, 91, passed away March 27, 2019, at home. June was born to Earl and Edith Bennett Campbell on August 31, 1927. June married Lloyd Albert Pfaff, in Glendive, Montana. She enjoyed sewing, baking, cooking, cards and games; and a member of the Village SDA Church. Survived by her husband, Lloyd Albert Pfaff; two daughters, Linda Doreen Foerderer and Lana Jean Eiseman; sister, Florence Filkins; brother, Monte Campbell; four grandchildren, four great-grandchildren, seven great-great-grandchildren. Preceded in death by parents; brothers, James and Michael Campbell; sister, Fern Jensen. There will be a private family gathering at a later date. Friends and family may share memories and sign the online guestbook at www.mountainview-colonialdewitt.com. To plant a tree in memory of June Pfaff, please visit our Tribute Store. "Email Address" would like to share the life celebration of June Pfaff. Click on the "link" to go to share a favorite memory or leave a condolence message for the family.